So very sorry to hear that Bernie Wrightson has passed away. Not just a towering talent (one of the greatest our industry has every seen) but a very nice man. I think back to the 1980s and the legendary Halloween parties Bernie had every year and it fills me with both a warm nostalgia and a deep sorrow. 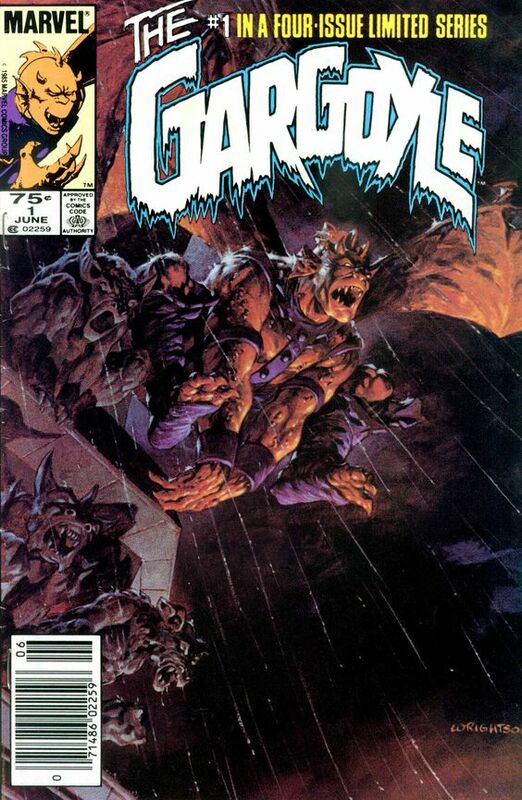 The art below is the cover to the Gargoyle mini-series I did for Marvel in 1985. We asked Bernie to do a cover for us and this is the amazing piece he contributed. No reproduction could do justice to the original painting which was massive. My heartfelt condolences to Bernie's family. Wrightson had the most bizarre talent of making the grotesque look absolutely gorgeous, and the mundane horrifying. For me, Wrightson's art defies analysis and cuts straight to the soul. I feel powerless to describe what I'm feeling when I look at his work, but I know it's got a hold of me. It was actually just a few weeks ago I picked up Punisher P.O.V. at a show. Now, I am no fan of the Punisher, but I am a fan of Jim Starlin who wrote it and Bernie Wrightson who drew it. I was struck by how disturbing the average people (well average for a comic story) who did bad things looked. I was also impressed by how he drew the villain, a mutated former 60s radical as well as a baby that was devouring innocent people more or less, but without realizing it(what did you expect a normal Punisher story from those two?). The child-monster creature, looked horrifying, and grotesque... and still sympathetic. The same was true for the mutated 60 domestic terrorist. An that last one was a straight up bad guy. No matter how disturbing the images were, you couldn't look away, and they always served a purpose. That was his true talent. I think it best comes to light in his most famous co-creation, Swamp Thing. Swampy is a horror superhero. That is no easy task to design. A horror artist may have made him too horrifying to view. Too disturbing. A superhero artist might go more the Thing or Hulk route where it is a monster, but still very human and recognizable. Wrightson, You couldn't look away... but you wanted to. The Horror and Humanity were all write there. For the world to see. That was his gift. He made you want to look at things you never should want to. He was of a different generation that artists now, and I mean no disrespect to the modern artists, but back then technical skill was less important than personality. Like everyone else of the time who made it big, he had a truck load. It is strange how quick some of this praise floats into my mind at a time when he can never hear such praise, but isn't that always the way. And nobody could set atmosphere better than Wrightson. IN the wake of his death, I was reminded that he did Simpsons Horror comics, displaying a whole other value to his art that will sadly probably go forgotten. Then there was hid work in Creepy. to paraphrase the song "A song for Superman," "I dispell we'll never seen other artist like him... again." But as sad as that is, isn't that the best sign of his talent? "Straight to the soul" indeed. SWAMP THING is one of my favorites of all time. I remember getting the book at the time it came out and thinking that I'd never read anything like it. The combination of Len's deliciously purple prose (and I mean that in the best sense) and Wrightson's art, which dripped with mood and mystery and humanity, made it an instant classic. Whether on his mind or not, I think Wein was trying to create a Silver Surfer for DC. So sorry to hear of Mr Wrightson's passing. I will never forget the effect his art had on me the first time I saw it. I'm sure I'm not the only one. RIP, Bernie, and thank you. I hope Bernie can feel all the love and gratitude echoing out across the universe.